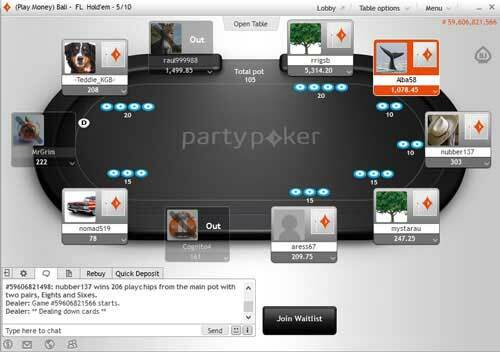 Party Poker is one of the world’s biggest online poker sites and also offers casino games and sportsbetting. PartyPoker.com was once the biggest online poker room, but since the 2006 UIGEA legislation it has fallen behind other sites like FullTilt and PokerStars. Nevertheless, it remains a great place to play, and you can enter the Party Poker Bonus Code FTR500 when creating your new account to get started with some free bonus funds. 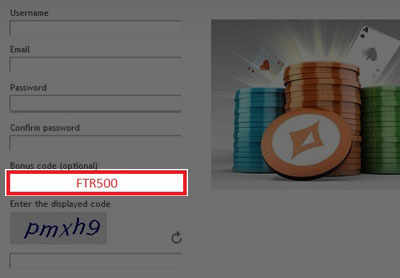 See the above screenshot, which shows where to enter your Party Poker bonus code. 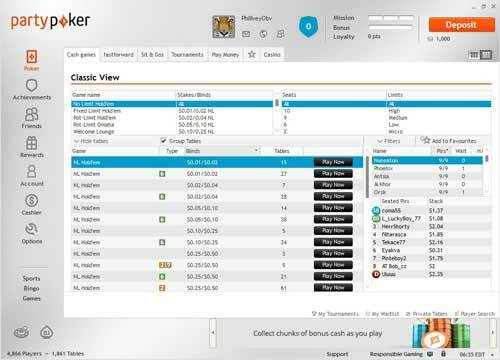 If you’re looking to make a deposit, PartyPoker will awarded new players with $22 free. This $22 bonus will be given in four $5.50 satellite tickets. These tickets can be used to enter satellite tournaments, which if won, will land you in larger tournaments for a potential huge payday. Minimum deposit of $10 required. Player must accept this bonus offer within 14 days of deposit. After accepting the bonus offer, 4 tickets, valued at $5.50 will be issues within 48 hours. Each ticket must be used within 7 days. Any unused tickets will be removed. There are no clearing requirements for this Party Poker bonus. Simply make your deposit, and use your tickets. Bronze Level is automatically awarded to all players who register at Party Poker and doesn’t require players to earn any points to achieve. This is likely why this is the only VIP Level that has remained unchanged. Bronze Level doesn’t offer players much of anything. Rakeback at this level is equal to 0% and the only reward available is the Weekly Bronze Loyalty tournament. Fortunately, it doesn’t take much to jump from Bronze to Silver Level. Silver has undergone the most significant reduction in points needed to earn the level. Previously, players were required to earn 400 Party Point every month to achieve and maintain this status. That’s $800 in rake! Now it down to just 50 points, which means that players need to pay just $100 in rake to get Silver Level! While Silver Level offers some rewards in the form of Tournament Tickets, which players can purchase through the Party Store, the rakeback value equivalent still amounts to only 5.33%. Gold Level requirements have dropped from 1,000 Party Points per month needed to achieve and maintain this level to 750 Points per month. While this may look like a small drop compared to Silver Level, it’s still a 25% reduction, amounting to $500 less that players have to pay in rake to achieve this level. Gold Level offers players the first glimpse at somewhat significant rewards. Gold VIP’s can buy Tournament Tickets worth up to $500 and Cash Rewards up to $100. The maximum amount of rakeback players can achieve at this level is 13.33%. The highest VIP Level at Party Poker has changed significantly in the way that it is now a monthly rather than a quarterly Level, just like the others. Previously, reaching Palladium Level required players to earn 9,000 Party Points every 4 months to achieve and maintain this level. Now it’s 2,000 Points per month. Overall, that’s a reduction of 1,000 Points. Palladium Level VIP’s can buy all the available Tournament Tickets from the Party Store as well as get Cash Rewards up to $1,000. The rakeback value of being a Palladium VIP is equal to 22.22%.